A woman relaxing while wearing a blue facial mask. Sometimes there's no need for the spa -- a facial mask can be your at-home solution for skin imperfections. Also called face masks, these skincare items can benefit all skin types -- just make sure you choose the correct product tailored to your needs. Hydrating masks are the key to beating dry skin, especially during the winter. 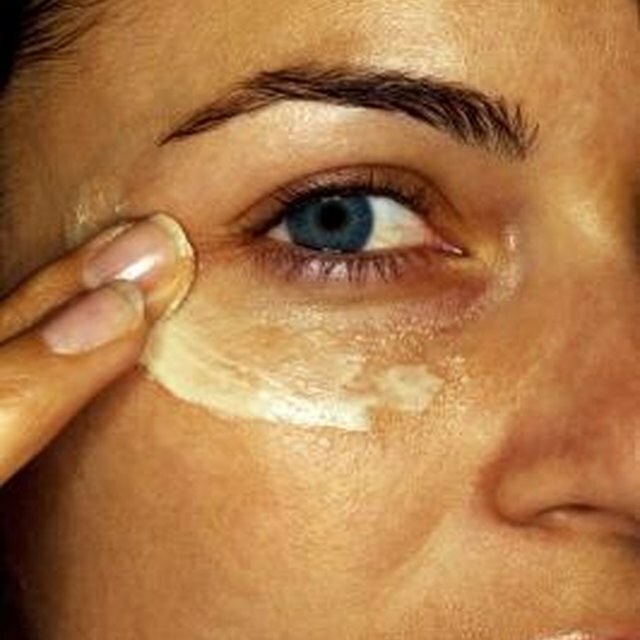 White algae, yogurt, rosewater and green tea are just some of the ingredients you may find in a hydrating facial mask. Use the mask after cleansing, but before putting on night cream. Facial masks can also benefit oily skin, but you should stay away from hydrating versions that may actually make your skin oilier. Instead, look for clay-based masks, as well as those that contain red algae. Such ingredients have the capability of drawing out dirt and excess oils, while tightening your pores. Certain face masks are loaded with antioxidants, and are made specifically for aging skin. Such masks can give your face a smoother and brighter appearance, while minimizing the look of fine lines and wrinkles. Seek out masks that have extracts from acai berries, kojic acid, licorice extract or retinol to aid in resurfacing the skin. Can Homemade Facials Reduce Large Pores?